Hi I'm not sure how do that. Would it help if I uploaded them to Imgur and sent you the link? For some reason the WWM emailer is cropping my message. Pasted below. <<I would also have you use the tools at *your* disposal; assuming these are South American, then review the families within the Gymnotiformes, excluding the highly distinctive Electrophoridae (one species: the electric eel). To wit; Fishbase; the family entries, set to show photos of the species; some are blank, but such fish are unlikely to be traded. A powerful tool that takes a few minutes to learn, and what I would probably end up using to identify your fish if it isn't obviously one of the commonly traded species. Hi Neal, thank you for those links however he is not like any of those pictures. I had sent a few pics of him but I guess they are too big so I'm trying to figure out how to upload to imgur and I will send you the links. Hey I uploaded it online instead because I don't have a computer and here's the link. 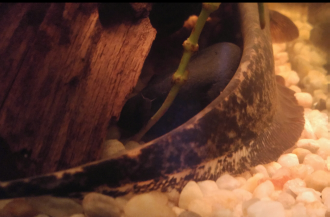 Hi guys, so awhile back I had sent you guys some pics of my knife fish but unfortunately they were too blurry but finally I got some good shots and uploaded them to Imgur. I'm really hoping you can tell me what he(she) is since I have spent countless hours on the internet and talking to others in the hobby. Hope to hear from you soon. species with standard lengths at the bottom. Should help you. I really appreciate it! I looked at the brown ghost knife and he does look similar however the stripe that runs down the body starting at the mouth is not the same on him. He has a very light line but it doesn't start until the back of his head and it doesn't run down his entire body to the tail. Also his coloring is definitely different than the brown ghost knife. 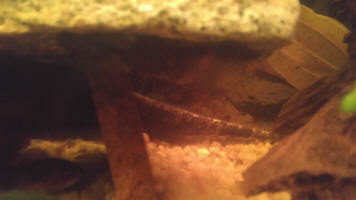 He is black/grey with white splotches down the bottom half of his body. As you said he is pretty large and his width is 4 inches and he's about 11 inches. 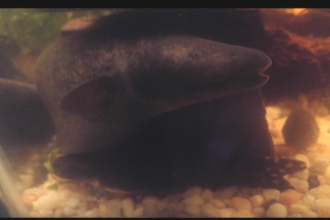 I have him in a community tank right now because I started a new tank for him but I'm in the middle of cycling it right now and I don't want to put them in it until it's done cycling so he's in with smaller fish and he's very peaceful with them except sometimes they won't leave him alone going in his cave so sometimes he uses his head to ram them out. I also saw him open his mouth once and it's huge! I was wondering if it's at all possible that he's a hybrid? Would different species of knife fish spawn in the wild? <Yes, but it's uncommon for all sorts of reasons. Still, it does happen. I know most don't care for the company of each other but he looks so different than any I've seen. His head kind of looks like a dinosaur. Thanks again for helping me out with this! Neal, thanks for such a quick reply. So I have one more question. I feed him live black worms which he happily slurps up. Is there any other foods I can give him? Sometimes I have given him blood worms but I know they shouldn't be a everyday food. I won't do feeder fish as they carry parasites but what if I breed guppy's or something similar for him to eat or is this unnecessary? micro-predators than anything else, and benthic invertebrates such as insect larvae are probably their main food. They do have substantial appetites though, so do keep an eye on how rounded his belly looks. I just want to give him what he needs and deserves.